Welcome to this week's first article focusing on independently developed games. The funny thing about being a ninja is how really, it's all about the basics. Sure, sure, you can learn advanced jutsu to channel your chakra into a deadly weapon, or distill a lethal poison for slipping into the drink of the man you've been hired to assassinate. There's the parties with other ninja, the endless fashion parade of simple black clothes and ever more expensive accessories ("Oh, didn't I show you my new shuriken? It's titanium.") Despite all the glitz and glamour of the ninja world, though, when you're on a mission it inevitably comes down to the simple things your first teachers tried to teach you: speed, agility, and intense concentration. N is a simple, addictive, and elegant game for PC, Mac, and Linux PCs. It is, at it's heart, a descendent of Lode Runner, itself based on Apple Panic. The premise is simple: you are small. The world is big. The world has gold, and lots of things that can kill you. Get the gold. Don't get killed. That's it. If that sounds familiar, it's because these sorts of games are also the precursors of Donkey Kong, and thus also of the Mario games. The genre is named after their most easily identified feature: they are platformers. N is a throwback to the game in its purest form. The controls are sensitive, with an "aftertouchy" nature that is not immediately apparent at first. After a few levels, you'll be making in-flight adjustments and making jumps that seemed impossible at first. The animation is great, the collision detection precise, and the various ragdoll movements that occur when you die -- in many, many gruesome and entertaining ways -- look disturbingly realistic, given their stick-figureness. I can recall the exact moment that I decided that I loved the game. 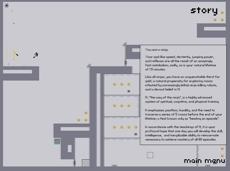 I had finished most of a level and had a clear path to the exit. There were a few bags of gold left, but they were in an incredibly dangerous spot. Trying to get them would have been foolhardy and arrogant. The sane thing to do was to head straight for the door. "The hell with that. I'm a ninja. I do not fear death." Leaping down into the crevice, I slowed my fall against the wall, narrowly avoided the proximity mines, grabbed the loot, and only then exited the level. Now that's what I call fun. N was written by two guys from Toronto over a six week period. There are no cinematics, cutscenes, plot twists, dialogue, or other extraneous material. The game application also includes a built-in level editor (somewhat hidden beneath debug menus -- read the documentation). N is an in-your-face slam at those who insist that the only way to improve games is to create a "more realistic virtual experience" (also known as "spending more money and thought on art and sound asset development than you do on gameplay"). N isn't just a great little game. It's a great little tutorial on what a game is, stripped down to its essential elements. It's a lesson that other game developers should heed. Download N for Windows, Mac, or Linux here. The game is absolutely free. Think about that the next time you discover you've shelled out $50 for another bloated, horrible, and unfun corporate game, such as Black & White. There's a superb interview with the developers at gotoandplay.it, wherein they talk about some of the collision detection and physics/ragdoll algorithms they used, as well as the challenges of developing a game in Flash. Definitely worth a read.